At Hanson Logistics we pride ourselves on having the expertise and flexibility to provide a complete service to our customers. Our enthusiastic attitude and experienced team are on hand to support you, this commitment, in conjunction with our quality derived management system means that you can be sure of a first class service. We operate a Top Tier COMAH Warehouse, providing secure heated storage locations in our high bay racking in compliance with all European Legislation. 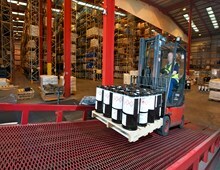 Our staff are fully trained in the handling and despatch of chemicals ensuring that your products are stored safely. We have a comprehensive CCTV system and our own ‘in house’ security team who look after our assets whilst we are away. We have the facility to store both Hazardous and Non-hazardous palletised products, these will be managed by your own client administrator who can update you daily, weekly or whenever you wish on your stock holding. Not chemicals, don’t worry we store much more than chemicals, everything from car bumpers to plastic boxes and with our knowledge of chemicals and the care that has to be taken with them you can be sure your goods are in safe hands. Our modern Warehouse Management System ensures that your products are stored in compliance with the segregation rules with no possibility of cross contamination.